The guys from Senner Tuning show signs that are a little tired of Audi. But they’ve bored hard … So hard, that now stop at Nissan. Latest victim? 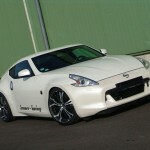 The new Nissan 370Z. For start take a look under the hood, where the engine of 3.7-liter V6 received an air filter and a new exhaust. The result? Extra 21 hp and a total of 352 hp. It’s enough? We continue with the outside and not really find anything other than new rims, Barracuda Tzunamee on 20 inches, available in Racing White or Matt Black Polish. And it all ends with a KW Variant 3 suspension, lower by up to 50 mm by 45 mm front and back! Sooper Model!!! and white is just awesome!!! What a lovely car! It was really carefully created. I can see the effort. It really catches my heart. With the modifications it has, makes the car even more beautiful. Nissan 370Z. you’re the best so far!